Walmart is the world’s biggest private-sector employer. Image: Walmart. The top 500 family businesses in the world generate more jobs per dollar of revenue than the Fortune 500, according to a new study. 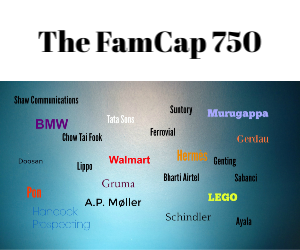 The Global Family Business Index, compiled by St Gallen University and professional services group EY, found that the top 500 family firms employed 20 million people in 2013, while the Fortune 500 employed 26.4 million. American retailer Walmart alone employs 2 million. Total revenues generated by the 500 were $6.5 trillion in 2013, just over half of the total revenues of the Fortune 500. On average, the biggest family firms created 1.3 jobs for every dollar of revenue, compared to the Fortune 500’s average of one. Forty-four percent of the 500 are owned by either the fourth generation or older, disproving the preconception that family firms rarely make it through the third – “shirtsleeves to shirtsleeves in three generations”, as the saying goes. Two, Japan’s Takenaka Corporation and Swedish business Merck, were founded in the 1600s. Six more began in the 1700s. Nearly half of the 500 (235) are based in Western Europe, with the big three eurozone economies – Germany (94), Italy (31) and France (28) – accounting for 153 of them. The single biggest country was in the US, with 101 businesses. Asia-Pacific had 62 businesses on the list, while India contributed 25. Latin American family businesses were represented by 36 family businesses, with Mexico and Brazil contributing 15 each. The Middle East including Turkey and Israel had 14, including six in Turkey. Just one was from Sub-Saharan Africa, a South African firm. Ninety of the 500 are in the retail and wholesale sectors, while 84 were diversified industrial holding companies and 75 consumer goods businesses. Interestingly, few family businesses were found in the banking (11) or technology (12) sectors. The split between private and public businesses was pretty much even, with 260 publicly listed and the rest 100% privately owned. In per capita terms, Switzerland has by far the biggest number of big family businesses with 17, followed by the Netherlands with 16. The top 10 biggest family businesses have a combined revenue of $1.74 trillion, more than the size of the 12th largest economy in the world, Australia, which had a GDP of $1.56 trillion in 2013. Although there are only a few family businesses in banking, there are many in asset management, with the sector comprising 34 of the 500. The capital intensive automotive sector also has a high number in the 500, with big names like Volkswagen, BMW, Ford, and Peugeot, sharing the list with lesser known automotive component companies such as Draxlmaier from Germany and Spain’s Grupo Antolin.